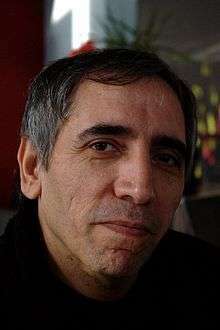 Mohsen Makhmalbaf (Persian: محسن مخملباف‎‎, Mohsen Makhmalbaaf; born May 29, 1957) is an Iranian film director, writer, film editor, and producer. He has made more than 20 feature films, won some 50 awards and been a juror in more than 15 major film festivals. His award-winning films include Kandahar; his latest documentary is The Gardener and latest feature The President. Makhmalbaf's films have been widely presented at international film festivals in the past ten years. The director belongs to the new wave movement of Iranian cinema. Time selected Makhmalbaf's 2001 film Kandahar as one of the top 100 films of all time. In 2006, he was a member of the Jury at the Venice Film Festival. Makhmalbaf left Iran in 2005 shortly after the election of Mahmoud Ahmadinejad, sixth President of Iran, and has lived in Paris since the events of the 2009 Iranian presidential election. Makhmalbaf was born in Tehran on May 29, 1957. At the age of 15, he became involved in a militant group fighting against the rule of Mohammad Reza Pahlavi, the then Shah of Iran, and at the age of 17 he was imprisoned for stabbing a policeman and sentenced to death. After serving five years of his sentence, he was released in the wake of the Iranian Revolution. He left Iran in 2005. Makhmalbaf is a major figure in Iranian cinema. His films have explored the relationship between the individual and a larger social and political environment. As a result, his work serves as an extended commentary on the historical progression of the Iranian state and its people. Makhmalbaf has worked in several genres, from realist films to fantasy and surrealism, minimalism, and large frescoes of everyday life, with a predilection (common to Iranian directors) for the themes of childhood and cinema. In 1981, he wrote the screenplay for Towjeeh, directed by Manuchehr Haghaniparast. In 1982, he wrote the screenplay for Marg Deegari, directed by Mohammad-Reza Honarmand. He made his first film, Tobeh Nosuh, in 1983, and Boycott, a film set in pre-revolutionary Iran, in 1985. The latter tells the story of Valeh (Majid Majidi), a young man sentenced to death for Communist tendencies, and is widely believed to be based on Makhmalbaf's own experiences. Makhmalbaf portrays human despair, exploitation, and resilience in The Cyclist (1987), a movie about Nasim, a poor Afghan refugee in Iran in desperate need of money for his ailing wife. Nasim agrees to ride a bicycle in a small circle for one week straight in return for the money he needs to pay his wife's medical bills. Time of Love (1991) is Makhmalbaf's ninth feature film and the first film of what he calls his "third period". It is a romantic trilogy that offers three variations of the same story. Makhmalbaf directed Gabbeh in 1996. The film follows the nomadic Ghashghai people, whose bright, bold carpets tell stories. The main thread features a young woman who loves a mysterious stranger but is forbidden to marry him. The film is romantic and non-realistic, with events seeming to leap around in time and space, much like a dream. Makhmalbaf took time off from directing in 1996 to form the Makhmalbaf Film House, a school for young filmmakers. It quickly became a private production house for the increasing number of filmmakers in his family. In 1997, his 17-year-old daughter Samira directed The Apple, using him as a scriptwriter and editor. Makhmalbaf's wife, Marziyeh Meshkini, worked as assistant director to her daughter and then took up directing herself. Kandahar (2001) is a fictional odyssey inspired by a true story set in Afghanistan before the September 11 attacks, as the Taliban's laws strip women of civil rights and hope and a Western-cultured Afghan woman returns to prevent her sister's suicide during the last eclipse of the 20th century. A Moment of Innocence: Among Top Ten Films of the Decade – Awarded by International Festival Directors and Critics 1999. Mohsen Makhmalbaf: Selected as the best filmmaker after the revolution by readers of cinema publications, 1988. Hamid Dabashi, Close Up: Iranian Cinema, Past, Present and Future. (Chapter on Makhmalbaf). Verso, 2001. Hamid Dabashi, Like Light from the Heart of Darkness. Sakuhinsha, Japan, 2004. Hamid Dabashi, Masters & Masterpieces of Iranian Cinema: (Chapter XI: Mohsen Makhmalbaf: A Moment of Innocence. pp. 325–368). Mage Publishers, 2007. ISBN 0-934211-85-X. Hamid Dabashi, Makhmalbaf at Large: The Making of a Rebel Filmmaker. I. B. Tauris, 2007. The Peddler: (Director’s interview, Screenplay, Reviews, and Study) Compiled by Ebrahim Nabavi, 1989. Salam Cinema: (Screenplay, Interviews, Reviews, and Study) Compiled by Amir Khosravi, 1996. Gabbeh: (Photographs with along Screenplay) Photography by: Mohammad Ahmadi, 1996. Silence: (Photographs with along Screenplay) Photography by: Maysam Makhmalbaf, 1998. Mohsen Makhmalbaf: (Review and Study) Compiled by: Alberto Barbara (in Italian), 1996. Makhmalbaf’s Broken Mirrors: (Review and Study) Compiled by: Lyrid Dijeon (in English), 2000. Introducing of Mohsen Makhmalbaf and his works: (Review and Study) Compiled by: Baharlou, 1995 (second print: 1998). "Salaam Cinema, Films of Makhmalbaf Family" by Pusan International Film Festival, 2000. "The Films Of Makhmalbaf (Cinema, Politics & culture In Iran)" by: Eric Egan, 2005.
" Makhmalbaf at Large" (Review and Study) by: Hamid Dabashi, 2008. "Mohsen Makhmalbaf: From Discourse to Dialogue" (Review and Study) by: Fernando González García, 2008. ↑ "All-Time 100 Movies". Time. February 12, 2005. Retrieved May 13, 2010. ↑ MacFarquhar, Neil (June 8, 1997). "1997 New York Times article describing the four periods into which Makhmalbaf divides his work.". The New York Times. Retrieved May 13, 2010. ↑ Bordwell, David, and Kristin Thompson , ed. Film History. 3rd. New York: McGraw-Hill, 2010. 610. Print. ↑ Axmaker, Sean (October 1, 2002). "Haunting 'Kandahar' a stark, surreal odyssey". Seattle Post-Intelligencer. ↑ Hamid Habashi. "Close Up: Iranian Cinema". Versobooks.com. Archived from the original on March 29, 2008. Retrieved September 7, 2010. ↑ Archived February 7, 2008, at the Wayback Machine. ↑ "Persian Poetry and Shahnameh Books – Culture of Iran from Mage Publishers". Mage.com. Retrieved September 7, 2010. Wikimedia Commons has media related to Mohsen Makhmalbaf.